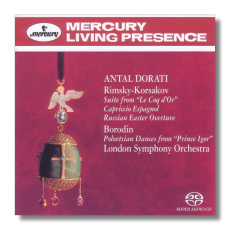 At last we are getting these fabulous Mercury recordings in three channel SACD sound! I can safely report that the sound is absolutely incredible both on a normal CD player with a perfect DSD transfer and on an SACD where the three-channel original tape sounds incredibly vivid. It is almost fantastic to note that the sessions date back to 1956, nearly half a century ago, with the Capriccio and Russian Easter Festival Overture dating to 1959! Antal Doráti was born for this Russian repertoire. The sense of excitement and dashing panache that he brings to the wonderful Capriccio Espganol is quite dazzling and the Russian Easter Festival Overture is similarly ebullient. The sound is astonishingly vivid with violins and percussion sounding actually in your listening room, a tribute to those talented Mercury engineers, Wilma Cozart and Bob Eberenz. I also greatly enjoyed the suite from 'Le Coq d'Or', another wonderfully evocative piece with the brass sounding particularly awesome. The incredible fact is that Borodin's dashing Polovtsian Dances were recorded in 1956 and the sound is absolutely riveting. Again, Doráti brings character and dashing ebullience to the music and he almost matches Sir Thomas Beecham (in much inferior sound) for swaggering intensity. Decca must be thanked for resurrecting these gems from the archive and I eagerly await further bombshells from the massive Mercury back catalogue.